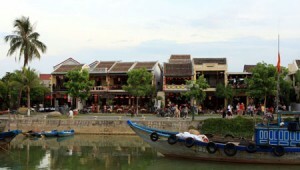 Hoi An’s Ol d Quarter and My Son Sanctuary, two UNESCO heritage sites, will be accessible free of charge for tourists from June 21-26 as part of the Quang Nam Heritage Festival. The event, now in its fifth year, celebrates the central province’s unique Cham culture. It also aims to stimulate the province’s socio-economic development and promote tourism, according to Tran Minh Ca, vice chairman of the Quang Nam People’s Committee and head of the organising board. Many new tourism destinations will be introduced at the festival such as Ha Thanh Beach in Tam Ky City, hot mineral baths by Phu Ninh Lake, a tour of the legendary Ho Chi Minh trail and tours to Bho Hoong and Dhroong villages in Dong Giang District. The event also marks the 10th anniversary of UNESCO’s Convention for the Safeguarding of Intangible Cultural Heritage, so international conferences on preserving intangible cultural heritage and promoting green tourism together with activities to promote tourism investment will be organised by the Viet Nam Institute of Culture and Arts Studies, UNESCO and the province. The Viet Nam-ASEAN Cultural Heritage Space will showcase traditional art performances of the 18 participating countries, while an exhibition by the Hoai River in Hoi An City will feature images of heritage in ASEAN. From June 19-22, Hoi An will host the third International Choir Festival with the participation of several choir groups from various countries and regions. The final round of Miss Ethnic Viet Nam 2013, a pageant to honour the beauty of young women from the 54 ethnic groups nationwide, will take place at Hoi An Theatre on June 26. Contestants will don traditional costumes, swimsuits and evening dresses to vie for the Miss Ao Dai, Miss Sports and Miss Tourism titles. In addition to cultural activities, there will be beach football, golf, traditional boat racing and martial arts competitions.